Sometimes runners ask a little too much of their bodies, incurring niggles or injuries that eat into precious running time. You may be advised to seek the help of a physiotherapist in treating a running injury and be unsure of the benefits or what the practice entails. Noel Thatcher is one of our resident physiotherapists. He has written this article to help you understand what to expect when you book an appointment. I found time recently to read Charlie Spedding’s excellent autobiography, Last to First. The book tells of an Achilles problem which plagued him during his running career and how it was treated. It occurred to me that Physiotherapy in the assessment and management of running injury has changed a great deal from the techniques that formed the bulk of the treatment in the 1980s. Research and clinical reasoning in areas such as pain, biomechanics, tissue repair and psychology have advanced a great deal. So to have our treatment approaches developed in order to address the various components of any given running injury. This enables us to tailor treatment to an individual’s needs and help restore them to their desired level of function as quickly as possible. This is not to say that treatment programmes have become more complicated. We understand that not all cases of runners knee have the same cause and cannot be managed the same way. The first thing to expect at The Running Works is a thorough assessment of your running injury. This includes your training and any aspect of your life-style that might impact on your injury. Our initial conversation is important as up to 70% of our diagnostic information comes from listening to you. We’ll be thorough in our physical assessments on the couch and on the treadmill. It’s important to see how you run in order to understand the forces acting on your body. This can be a challenge when your pain only comes on after 15 miles of running on the Alpine trails! We will be specific in both our assessment and exercise prescription. No “one size fits all” recipe book exercises. The team appreciate that people live busy lives and aim to provide effective exercises which will enable your body to do the job you want it to. Hands on treatments are still a very important and integral part of what we do. We use massage in its many forms. Joint and nerve mobilisation techniques help to decrease sensitivity in tissue and assist healing but massage alone is not going to cure an Achilles tendon problem. We give advice regarding training adjustments which may be necessary in the short term. The last thing we’ll do is tell you to stop running unless it’s absolutely necessary to protect your healing tissues. If you need advice regarding footwear, we are only a few feet away from experts with whom we can discuss your needs. We can help with even the most stubborn problems and have access to some of the leading biomechanists, podiatrists, and sports scientists around. Visit the Sports Clinic page on our website for more information on our services. To book an appointment please call 020 7036 2326. The Running Works Sports Clinic has two treatment suites situated inside the shop. We are extremely lucky to have Noel Thatcher on board with his 25 years’ experience in the field of physiotherapy. His area of clinical interest is the prevention and management of sports injuries. Noel understands what it’s like to be on the other side of the fence as a runner. 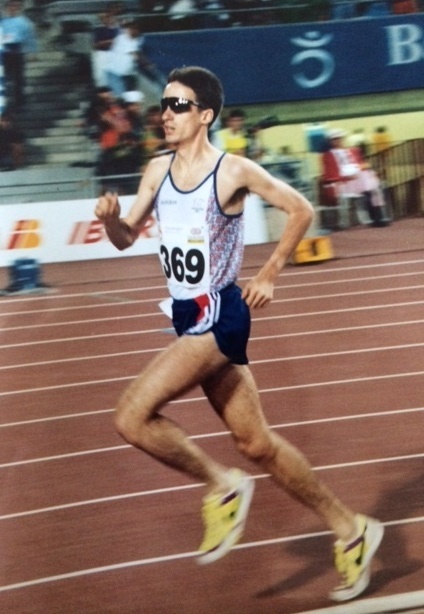 He competed in six Paralympic Games and won five Gold Medals in a career spanning 20 years, He was awarded an MBE for Services to Disabled Sport in 1997 and was inducted into the England Athletics Hall of Fame in 2009.